As snow has eventually descended on us, here in the UK, I thought it was the perfect time to review some lip balms. It's January and the last thing we need is anything else to dampen our moods. Dry, chapped, cracked lips, just look awful. They can be sore, red and in some extreme cases, they bleed. The simple solution? Invest in a great lip balm and stop the cold from attacking your lips. But, with so many on the market, which are great and which, from experience, would I recommend you avoid? This American brand, Malin + Goetz, prides itself on creating natural products that are aimed at finding solutions to sensitivity and irritation, whilst delivering products that really do what they should. 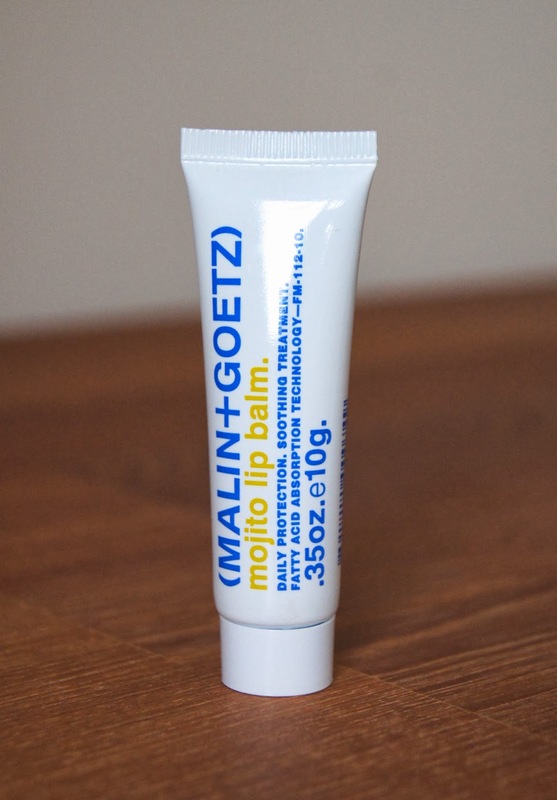 I'd never heard of the until I came across the Malin + Goetz Mojito Lip Balm, when scouring the Space NK website, one evening. 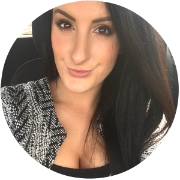 After trying this out, I will certainly be getting my hands on some of their other products! Unlike tradition lip balms, this one has a thick, gel consistency. The thing that drew me in with this product, in the first place, was the mojito fragrance. Everyone loves a good mojito, right?! Whilst there is a distinct citrus scent, it's not quite as nice as I had hoped it would be. But, all is not lost, as the formula just works wonders. Colour free, it leaves a glassy shine on the lips, that surprisingly, isn't at all sticky. This shine helps to make your lips look plumped and much fuller, too. It feels much nicer on the lips than any other balm I've tried, being so silky feeling. It seems to patch up, rather than emphasise, any dry areas, filling them in and creating a completely smooth canvas. Even if you lick your lips a lot, like me, the balm lasts so well, without much need for a top up for a good, few hours. When I've used this, my lips are much more hydrated afterwards and are left looking and feeling so healthy. One downfall of this product, is the packaging. 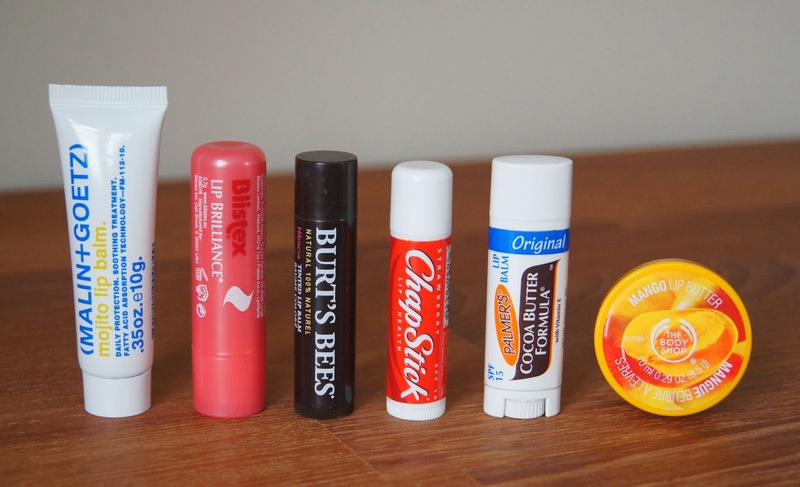 You get a great amount of product, housed in a tube not that much bigger than regular-sized sticks of lip balm. But, it is hard to apply. Straight from the tube doesn't really work, as any excess leaves the cap messy and you waste the gel. Putting it on your hand takes a longer amount of time, when you're on the go. I find squeezing a little out onto my finger and rubbing it onto my lips is best, but it is much more of a fiddle, compared to a quick slick of Burt's Bees or Palmer's. Whilst it is the most expensive balm in this line up, at £10, the quality is just miles ahead. You only need the smallest amount of this, as it blends so easily, so it will probably last a much longer amount of time, compared to the others, too. 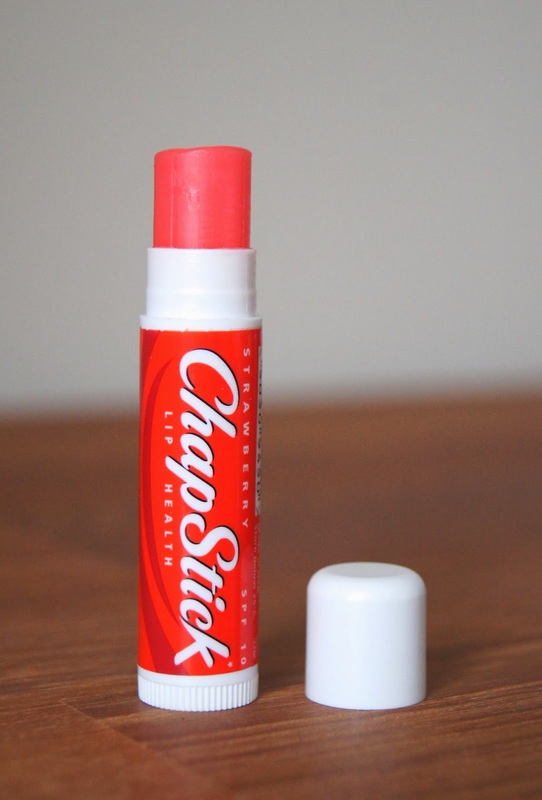 ChapSticks take me back to my childhood, when I would feel so grown up getting my 'lipstick' out and applying it. The strawberry flavour has always been my favourite and every time I have a sniff of that sweet, artificial scent, it brings a smile to my face (nostalgia central). Not only that, it tastes exactly like how it smells, which is just awesome! This is a protectant, rather than a lip moisturiser and you can definitely feel that, when it's on the lips. It doesn't really sink in, but just coats them, creating a barrier between the delicate skin and the harsh weather. A great choice if your lips aren't particularly dry or sore, but you want to keep them that way. The neon pink colour of the balm doesn't translate onto the lips at all and you hardly notice it on, as it doesn't have a glossy finish to it. An SPF of 10 helps to protect the lips from the sun's rays (which may not seem too important in the current climate, but we should wear SPF all year round, really). The packaging isn't fancy whatsoever and it has gone through various transformations over the years, but I like how it isn't over complicated. The lip balm stick makes it easy to use, meaning you're able to pop some on anywhere, at any time. Its tiny size means it can be slipped into your pocket, too. I have found that if you over wind the balm, it can get stuck and you have to push it back down with your finger, which is annoying. But, at just over £1, it really is a bargain and that is only a tiny problem. 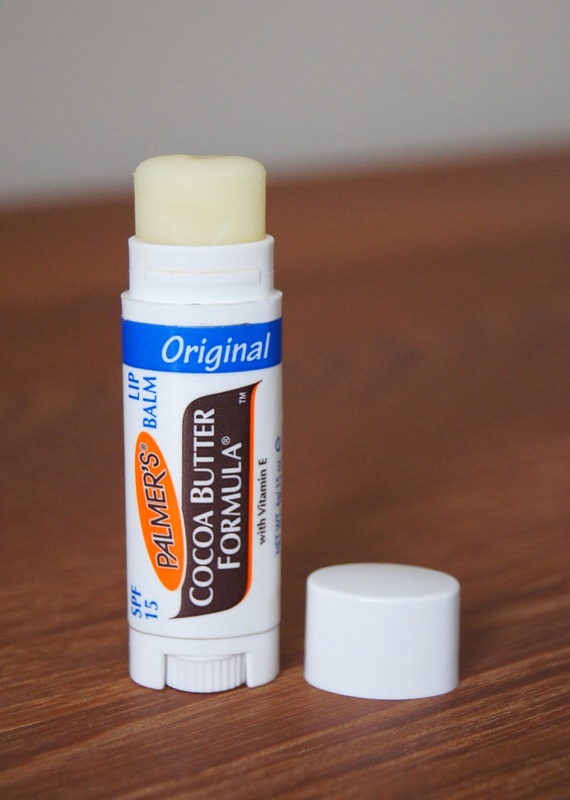 Like the ChapStick, the Palmer's Cocoa Butter Formula Lip Balm is also a protectant. But, it does contain Vitamin E, which also nourishes the lips effectively. The balm itself isn't too soft, but it melts onto the lips when you apply it. There is a little bit of a greasy feeling with this one, but it isn't sticky or uncomfortable. Although, sometimes the balm creeps over the lip line, as it is so slippery feeling. I don't find that it lasts too well on the lips, as the balm sinks in completely after a while, but it's a pleasure to keep reapplying. After wearing this, I can definitely notice a difference in how smooth my lips are; any dry skin is seriously softened and comes away easily after use. It smells strongly, like chocolate, which is so, so good and that lingers on the lips during wear. Unfortunately, it doesn't taste quite as delicious and isn't nice at all, if you lick your lips. The addition of an SPF of 15, is great, as you don't have to think about using a separate, specific sunscreen. Considering this balm has a similar or slightly larger amount of product than some others, this has the smallest packaging of them all. This is a great product for men, too, as the tube isn't at all feminine, it fits into your pocket easily and it doesn't have a girly fragrance to it. At just £1, this is so cheap and is much better quality than some others I've tried, which cost significantly more! 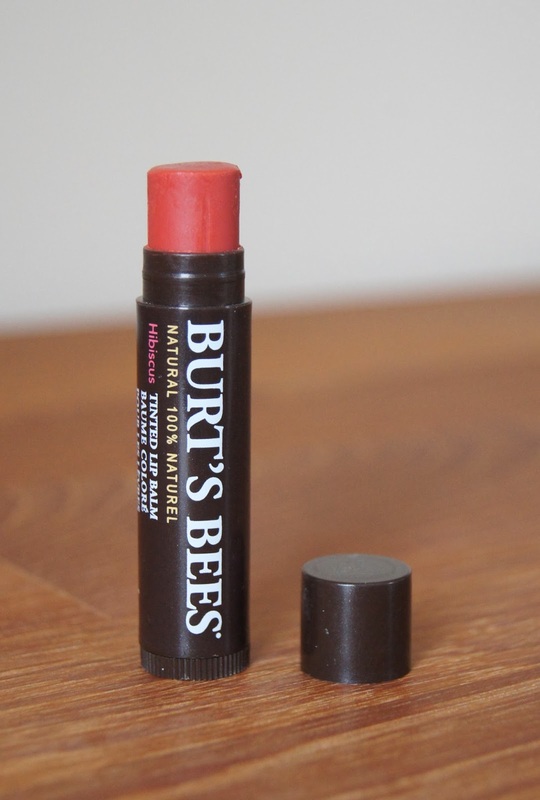 The Burt's Bees Tinted Lip Balm is much more soft and creamy in formula, which means you may get through it more quickly. It is so soft, that you end up with a lot of product on the lips, almost too much, which can feel sticky. It has a glossy finish to it and adds a sheer tint to the lips. This tint means that it is a bit more special than just your regular lip care product and means you can add colour, whilst caring for your lips at the same time. I did think that the tint would be a bit more powerful than it was, though and it definitely doesn't stain the lips at all. However, it does mean that you can apply this pretty haphazardly, without needing a mirror and it will still look great. 'Hibiscus' is quite an orangey tone on me, even though the packaging makes it look a lot more pink in colour. Sheer lip colours look different on everyone though, depending on your skin tone and natural lip colour. It smells lovely, fruity and floral, but doesn't taste good. 100% natural, this balm doesn't contain any horrible, chemical nasties. Rather then being full of Petrolium and Paraffin, it's made with lots of nourishing, natural oils and beeswax. This formula is actually caring for your lips, as well as protecting and you can really feel it moisturising them. However, I don't think that it makes as much of a difference to my lips, compared with the Malin + Goetz or Palmer's balms. This balm comes in a cardboard case, which I do find unnecessary and wasteful, but it does make it feel more luxurious, compared with standard packaging. Again, it is a stick lip balm, which makes it really handy to carry around on a daily basis. As it is so soft in texture, I would be careful when keeping it in your pocket or near something hot, as it may melt. At £5.99, it sits somewhere in the middle, between cheap and pricey, as does the quality of the balm itself. 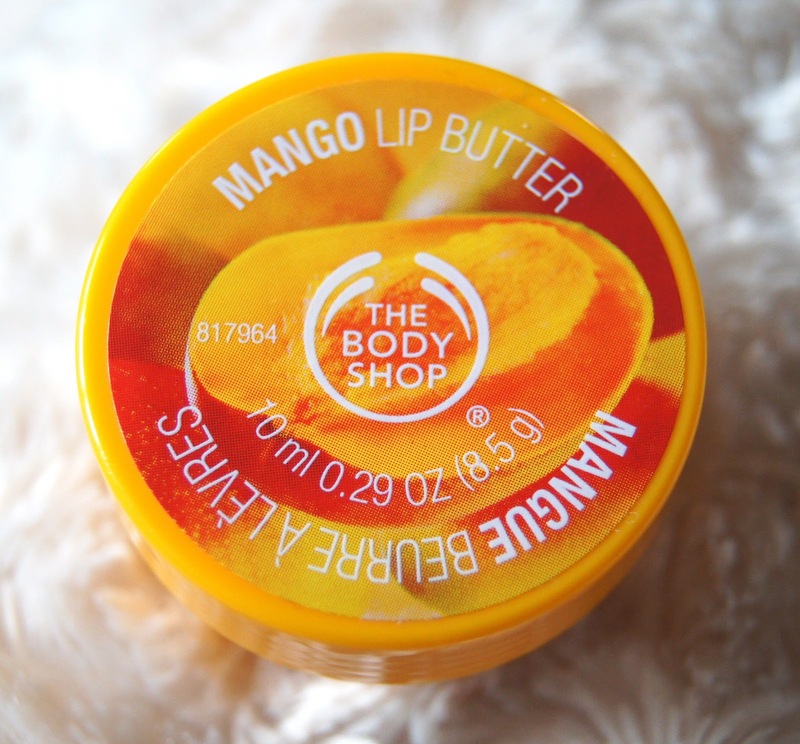 When I first tried The Body Shop's Lip Butters, I was surprised at just how unlike butter, the formula was. Expecting the balm to be softer and more creamy, I was disappointed. It took a lot of work to get enough to fully coat my lips, out of the pot and it wouldn't be the best if I was in a hurry. One redeeming feature, is that it smells amaaazing and fruity. But, like the Burt's Bees balm, the taste doesn't match the delicious, mango scent. It feels nicely moisturising on the lips, but I did notice that the rougher parts of my lips seemed to be exaggerated, both on looking at and feeling them. It leaves the lips looking glossy, but adds a tiny hint of a milky colour, rather than a completely clear, glossy finish. I had the highest expectations for this balm, in terms of how moisturising it would be and I was severely disappointed, as it was one of the lowest ranking in that category. I do find pots of products annoying, especially when my nails are a bit longer and the pots are so small, which is the case with this one from The Body Shop. It is more of a bulky item, that wouldn't fit into a pocket as easily as the others that I've reviewed in this post. Price wise, at £4 it's also more expensive than the majority and, even though you get a lot more product, the quality just isn't good enough, for me. Blistex are a brand that offers a huge selection of various lip balms, with different formulas, colours and flavours. Some are a hit and some are a miss, in my eyes. 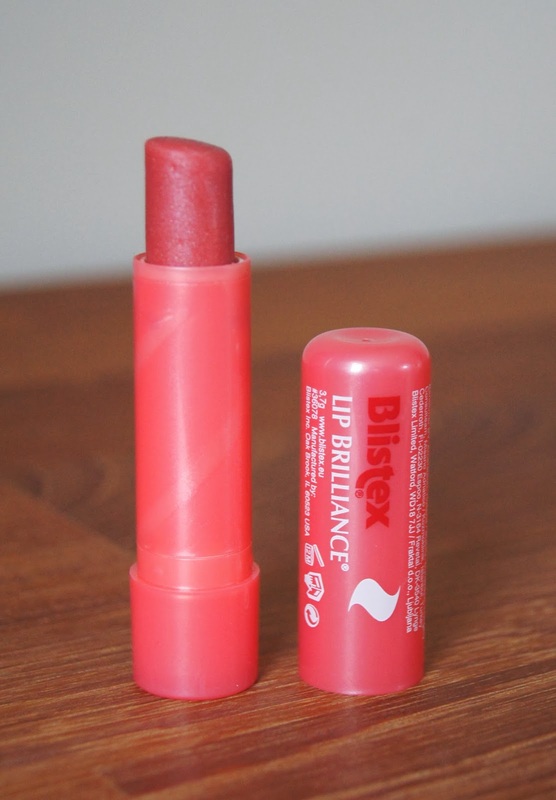 This time round, I'm focusing on the Blistex Lip Brilliance balm. Firstly, this smells and tastes gorgeous, but after an hour or so of wear, I do start to get sick of it, with it being so strongly scented. The balm stick has a strong, pink colour to it, with a lot of silver shimmer suspended within the formula. Whilst the shimmer is very obvious on the lip, the pink shade isn't very pigmented at all, just adding a tiny hint of colour. Even though the stick form is quite firm and hard, the warmth of your lips lets the balm glide on, without overloading them with product. There isn't a greasy or sticky feeling with this, but unfortunately, it does wear off quite quickly. After a full day of using it, if anything, once it had worn off, my lips felt more dry and a little irritated. Whether that was because it didn't do a very good job of protecting my lips from the weather, or because the fragrance was just too strong for my skin, I'm not sure. Either way, I won't be choosing to use this again in a hurry! I wouldn't recommend this product if you have very sensitive skin, as I don't and even my lips were left in a worse condition than before I used it. I prefer this stick packaging to the other wind up balms, as it is more of a traditional lipstick casing, which doesn't get stuck when wound too far. It doesn't look cheap and nasty, nor fancy, but it does the job. Like all of the others, it is easily to slip into your pocket or bag and is great for when you're on the go. It is cheap at £2.61 and won't run out too quickly, so won't break the bank. Which lip care products do you turn to when your lips are in need of some TLC?